Many implementations of ReactiveX use “Schedulers” to govern an Observable’s transitions between threads in a multi-threaded environment. You can instruct an Observable to do its work on a particular Scheduler by calling the Observable’s SubscribeOn operator. The ObserveOn operator is similar, but more limited. It instructs the Observable to send notifications to observers on a specified Scheduler. In some implementations there is also an UnsubscribeOn operator. To specify on which Scheduler the Observable should operate, use the subscribeOn operator, passing it the appropriate Scheduler. 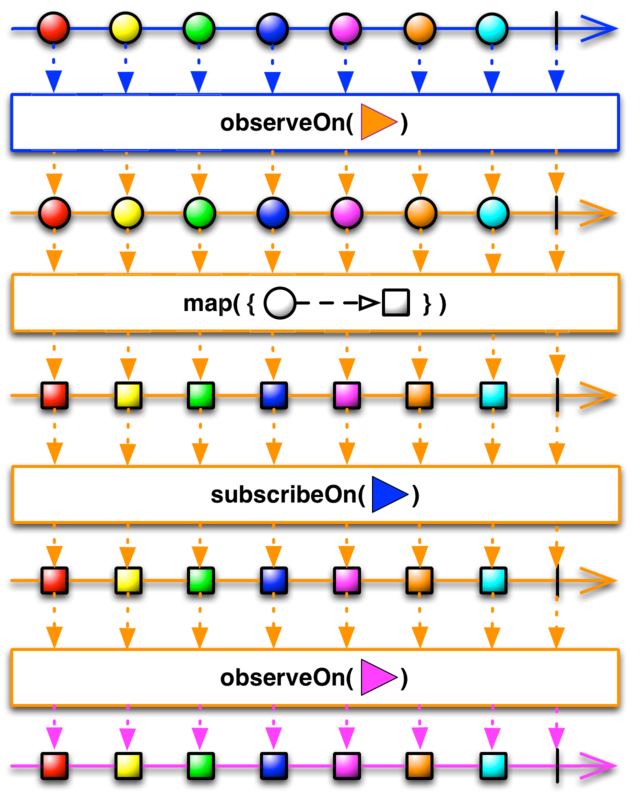 To specify which Scheduler observers will use to unsubscribe from an Observable, use the unsubscribeOn operator, passing it the appropriate Scheduler.